I wanted to get out of my blank image and homeliness! I covered half of my face with my hair. I needed long hair bangs to cover my side cheek bones, square jaw, and sunken cheeks. I had a low nose and small eyes. My face was just a mass. and I wanted get away from this blank and dull image for my confidence! and square jaw didn’t give her smooth facial contouring. She didn’t have double eyelids and her eyelids were thick which made her look dull. Pretty and smart math teacher! I booked surgery in Braun and had a weeks vacation. My students got surprised to see that I changed so much during the break. “My sister needs surgery, so let me know where you got it from. Mom, I will be back pretty! It wasn’t hard until I decided on surgery. But I didn’t feel comfortable to get surgery alone, so I went to the clinic with my mom. I was excited and hopeful. I was talking to my mom while I was waiting in the clinic. had my eyelid line drawn and then went in the surgery room. The anesthesiologist said “I am going to start” and I fell asleep. When I woke up, my face was wrapped and my nose had a splint. My eyes and face didn’t get swollen. I took a photo with a lifting band on. I had a lifting band on every day because it would help with swelling and keep the facial contouring. On the 5th day, I went to the clinic and got the nose splint removed! I also received skin care treatment and lymph treatment. I felt a lot better after! After the nose splint was gone, I could breathe easily. The swelling between my eyes was still there, but the nose line looked great, right? My doctor said I don’t need to worry and just need to relax. It's only been five days, but the swelling on my chin was going away and I liked my nose line. I was really impressed. Who knew the nose line could be this pretty!! I always had a lifting band! I stayed at home so my skin looked great. so I didn’t have to do anything. They even washed my hair. It was so great, especially for those who have long hair. 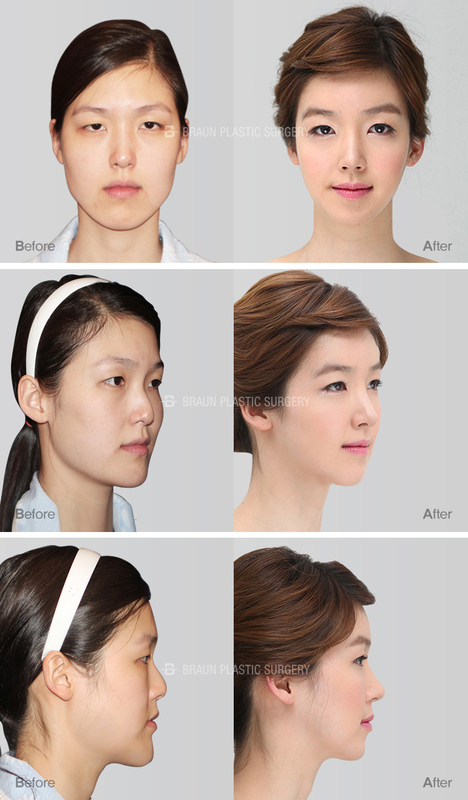 After facial contouring surgery, a baby tooth brush is needed! The nurses said I needed to brush my teeth right after eating. I brushed every time because I didn’t want to get inflammation. on my eyes was going away fast so my eyes looked better. My eyes look so natural! The lifting band became a necessity for my life! I am going to use it for a long time! I was told it’s good for cheek bone and jaw placement. Going back to work after the surgery! Returning day after the vacation. I was nervous in the morning worrying if anybody would say something bad. But I went to work confidently. 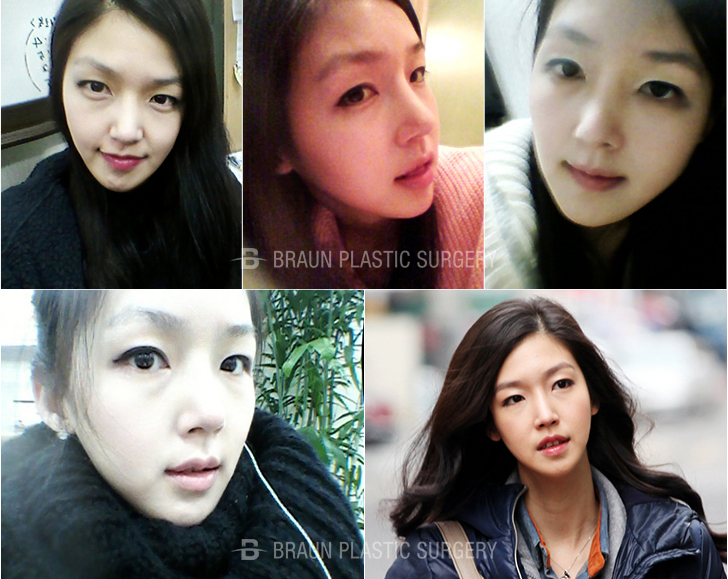 People know that I had surgery, so they complimented me that I became pretty! I became a star at my academy!! The swelling of my nose and jaw was almost gone. At first, smiling was hard, but I could make facial expressions. I used a lifting band for a long time. I think that’s why the swelling was gone quickly. And I didn’t get saggy cheeks!! “Are you becoming younger?” A middle schooler I teach told me. I wanted to answer “It’s because of the time and patience at Braun”. I didn’t know the outcome would be this satisfying at the end. I thought I would be pretty instantly right after the surgery but that was not true. It didn’t happen overnight but my dream came true anyway!! Now I put my hair up and use a hair band confidently! My friends told me the surgery was a good choice and they were happy for me. I became confident and my self-esteem got higher. I am smiley all the time. People tell me that I look happy. Yes, I am super happy now!